At its core, a video marketing strategy is a plan to grow a community of "true fans". These are people who will consume everything you put out, who will interact with your brand on social platforms, and who, ultimately, will purchase your product. I'm not talking about the "Raving Fans" concept by Ken Blanchard and Sheldon Bowles, I'm talking true fans, the Kevin Kelly theory. If you were a musician or music fan in the early-ish 2000s (MySpace, am I right? ), this might sound familiar to you. Kevin Kelly, founding editor of Wired magazine, posited in 2008 that an artist can survive on about 1,000 “true fans”, give or take. The idea is that 1,000 die-hard fans will buy everything you put out. Every album, t-shirt, and concert ticket. With the financial support of these 1,000 true fans, you wouldn't need to be a super famous artist with millions of casual listeners who just like one song in order to make a living. Translate this theory from not-so-starving artists to a company. True fans are repeat customers. Kind of like how Starbucks’ big focus is on the customers who come back every day. Those people are where a ton of the chain’s profit comes from. So if we all agree that keeping your customers happy and coming back to you to buy all the stuff you produce, why wouldn’t we think the same about your content? Many companies using YouTube look at subscriber rates as the end-all-be-all. But if your YouTube channel has a million subscribers and your average video's view count is only 100, you’re missing out big time. Tons of people have raised their hand and practically yelled at you "yes, please, I'm interested, send me more of that stuff you do!" but that low average view count is proof you're not reaching them. These are people who would be more likely to watch anything you put out than any other person in the world. It's shooting fish in a barrel, and yet you've managed to miss. Even if you have one random video that gets 1 million views, it's not going to automatically lead to additional subscribers unless it serves as a gateway to other similar, relevant and appealing content. Yeah, sure, you got one fluke success, but is it even impacting your business? Or are people just watching that one video and then moving on to a cat playing a piano? One video isn’t a strategy. I’d rather have 1,000 true fans who watch, share, and buy everything I deliver than 1 million people who just watch one video and never engage with anything else. A video strategy, at its core, is a plan to build a community of true fans. It’s a structured plan to offer valuable content that resonates with your audience and keeps them coming back for more. The more they come back, the more they engage. And the more they engage, the more likely they will buy. No matter what kind of video or where it lives, it should relate back to your brand. Say you’re a luxury shoe brand. Many of your videos on YouTube and Instagram look professional and gorgeous, and depict an ideal, aspirational lifestyle. What would it do to your brand perception if some of your other videos were ugly, boring, and clearly shot by an intern on a flip phone (assuming they still make flip phones)? There is a time and a place for each of those styles. One tells a story of an aspirational type of product, and the other is a gritty, garage band style DIY kind of product. Unless you’re specifically setting out to create a brand that encompasses both products, trying to do both at once doesn’t really work and only ends up confusing your audience. It’s basically saying simultaneously that you’re selling a super fancy and expensive product but also maybe somebody could make it themselves rather than give you money. Not ideal. There are tons of different types of content out there. Pro tip? Don’t try to do them all. Pick a handful that make the most sense for your brand and do them well. Let’s go back to that fake shoe company. A luxury shoe brand probably wouldn’t make tutorials on how to DIY a shoe, but it might do a documentary series about how professional shoe designers find their inspiration. Make sure you’re picking the right content type for your audience. I use YouTube and Instagram as examples a lot because I personally spend so much time on them both. However, a millennial woman with a Netflix addiction and a penchant for League of Legends gameplay videos might not be your target market. If you’re delving into video, you’ve probably already got a social media strategy, which means you’ve likely pinpointed where your particular market likes to hang out. You’ve probably already got a ton of research about which social media platforms to target, and worked on building audiences there. Add video to the editorial calendar of these existing spaces--the main platforms have video capability, and if there’s one that doesn’t, it’s about to launch it. Whether your organization’s goal is getting a customer to buy a product, listen to your podcast, or vote in the next election, make sure it’s communicated clearly and often. Yes, you want people to watch your videos, subscribe, and engage. But that’s not allyou want them to do. If they’re doing all those things, they’re raising their hand and saying they are interested. So give the people what they want already! What's your ultimate goal? In business, in life, I have no preference. Let me know in the comments! I'm Audrey Lecker-- MBA, video marketing expert, and social media content strategist. I teach musicians, artists, and creatives how to build a profitable audience online. 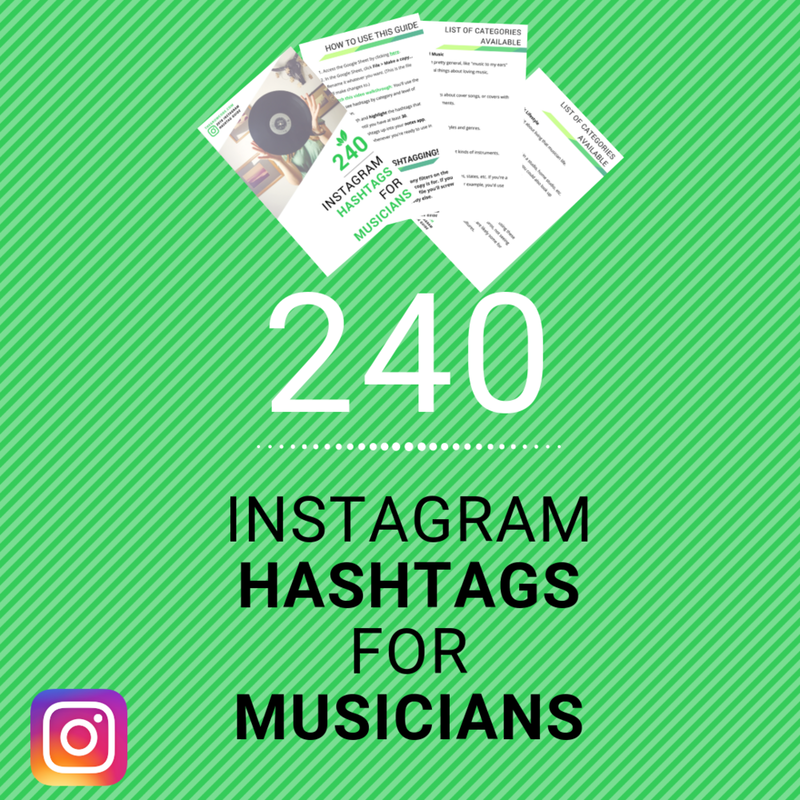 Get your Instagram Hashtag cheat sheet here!